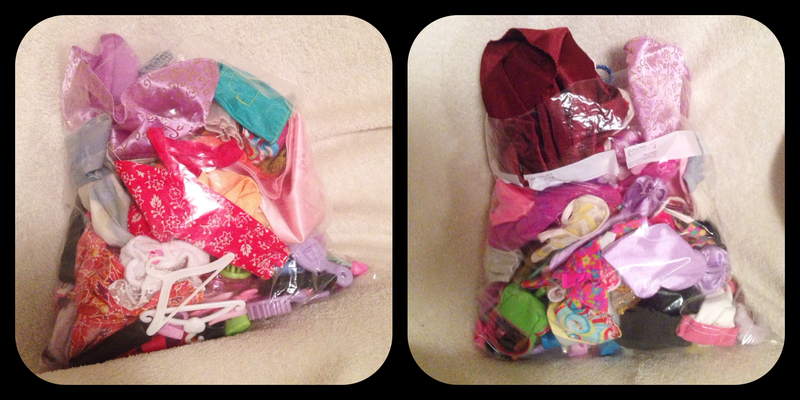 Giant Bag of Clothes, Part 1 | Barbie Who? I am so excited! I have this awesome new find to show you all. I was at the thrift store on base yesterday. We were doing our normal shopping, and in the consignment area I saw a gallon sized bag of Barbie clothes. At first I wasn’t sure if it was worth the price, $5.00, but then I realized that some thrift stores charge $1.00 per outfit and this bag clearly has more than five outfits. I ended up buying it because the Rapunzel dress was calling to me, and I am incredibly happy that I splurged. This bag has so much cool stuff inside of it that I can’t believe I ever hesitated to buy it. I was so excited to open the bag when I got home that I didn’t take a picture of it until after I had cut the top off. Oops! I haphazardly put the stuff back inside of the bag and took a picture for posterity, as you can see above. After that, I started sorting through everything in the bag. I was not disappointed by the contents. It contains 23 outfits, a few miscellaneous pieces of clothing, 20 pairs of shoes, 9 brushes, 2 handbags, 5 hats, 5 Barbie hangers, 1 mirror, and 1 pair of purple glasses. This bag of clothes was able to single-handedly solve the problem of naked dolls without me having to make them all myself. Well worth five bucks! The one bummer is something that happened to the purple glasses. They were bent, and I broke them when I tried to bend them back into place. It was my mistake; I should have warmed them up before I tried to mess with them. I may try to glue them back together, but that is a topic for another time. For now, I will go ahead and show you the most complete outfits. There were a few miscellaneous single pieces of clothing that I didn’t picture (a few pairs of shorts and a broken halter top, to be exact), and they may show up randomly another time. This is the vast majority of the contents of the bag. Because it takes time for me to upload and write about the pictures, I am breaking this up into two or three blog posts. I will work on them and get them published as quickly as possible. First up is an awesome cape! I love the color of it. 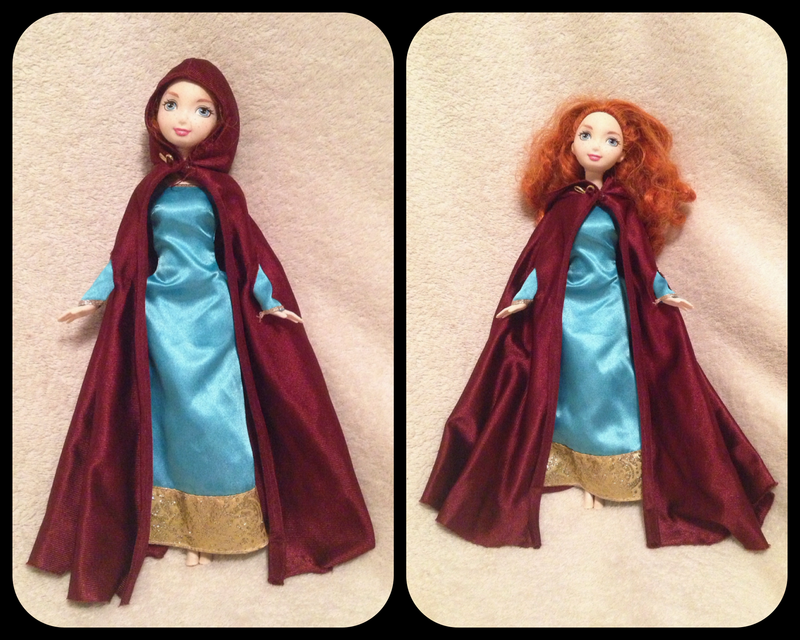 The deep red is stunning and matches the Merida doll perfectly. It can even tame her hair. I don’t know what doll the cape is from. It doesn’t have any tags or marks, and I don’t recognize it from anywhere. It reminds me of something worn in The Lord of the Rings, but I wasn’t able to find anything online with the same color (their capes were all green). Even if it is unidentifiable, I think it is a lovely piece and I am very happy to have it as part of the collection. A giant thank-you to Audrey B. for telling me that this cape comes from the Star Wars Episode 1 Hidden Majesty Queen Amidala doll. You can see a picture of it here! 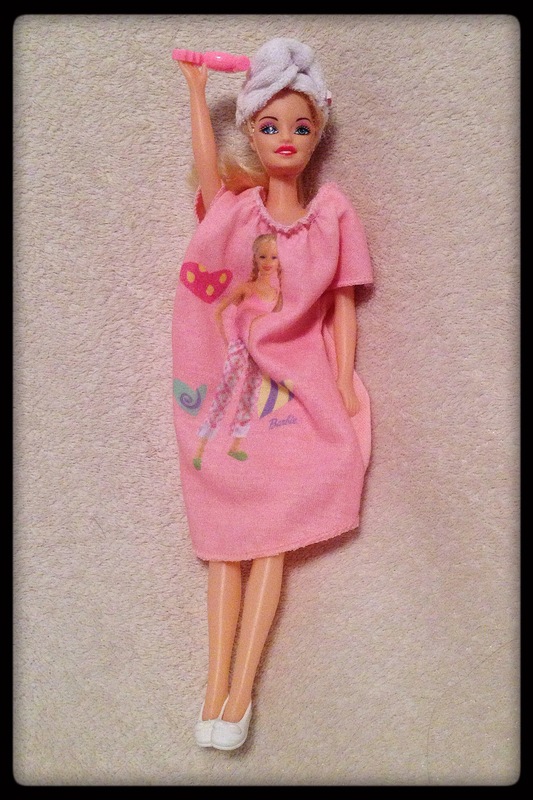 This is a generic doll in an oversized sleeping shirt. For this outfit, the accessories make it awesome. She has a towel on her head (held on by a clear band) and a blow dryer in her hand. She also has a pair of cute white flats on. I’m not sure if I love the oversized pajamas, but everything else about this is a lot of fun. It certainly makes this less-than-stellar doll look as good as the real Barbies. My favorite piece from this outfit is the towel. I wan’t able to find out what doll(s) the outfit and accessories are from. This outfit is amazing! It is a paisley halter top bikini with a pair of red sandals. Splash n’ Color Kira pulls it off better than any other doll I own. I tried to find out what set this bikini came with, but that turned into a wild goose chase. 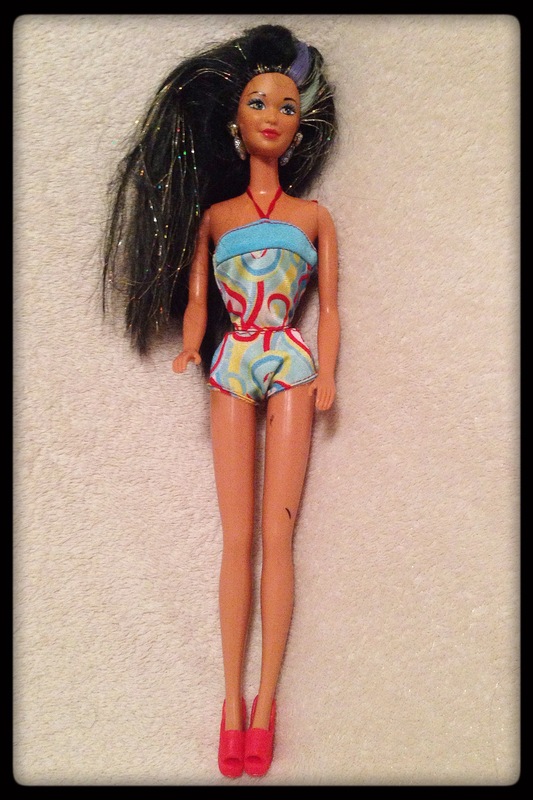 I found a picture of a fashionista doll wearing the same top and a Ken doll wearing a pair of trunks in the same pattern, but I could not find out what this outfit was called or what doll it came with. Oh well; you win some and you lose some. This outfit is adorable, and it matches the doll fairly well! When I first picked her up, I thought she was a Taylor Swift doll. 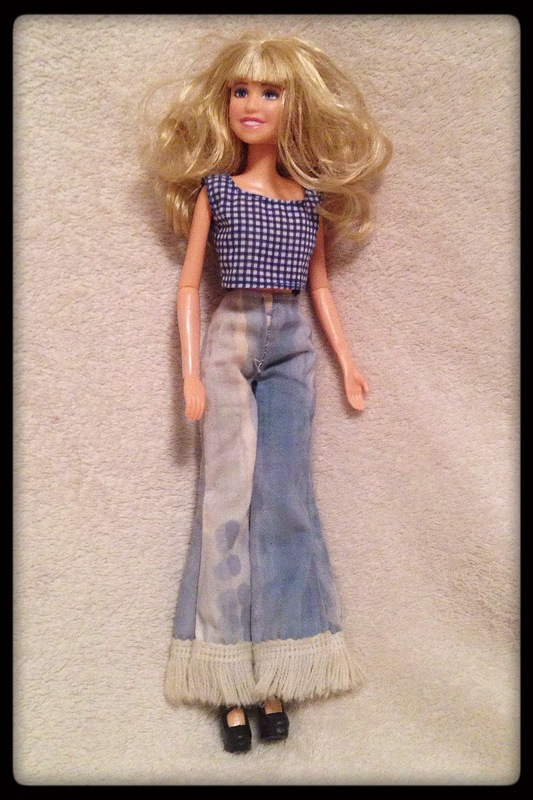 Once I researched her, I realized it was actually a Hannah Montana doll. I would like to think it is because the bodies for Jaaks dolls are similar, but in reality it is probably just because I need to listen to more contemporary music. But enough about the doll, we are here for the clothes. 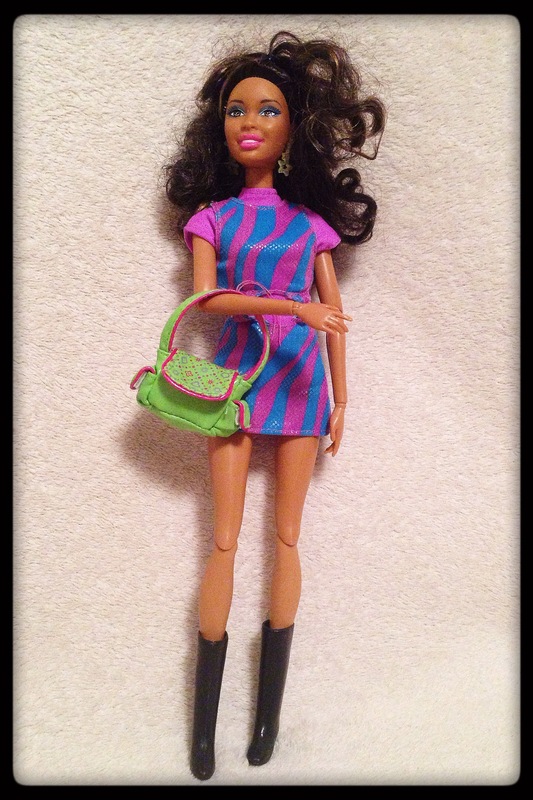 None of these pieces for this outfit had a Barbie tag, and none of them came from a set I am familiar with. Either way, I think this is an adorable outfit that is well made. The jeans have really grown on me; I may need to bleach and sew some tassels onto a pair of my jeans to match it. Here is Belle in a pink dress! This dress is adorable, but the clear straps on it are broken. I am not sure if I can fix it… I know that I may be able to sew it back on, but I have had terrible luck sewing these plastic bands back onto clothing. I haven’t decided exactly what I want to do. It doesn’t stay up very well without the straps, so I do need to figure something out. I may end up adding a piece of lace or ribbon to the top in order to make the dress stay up properly. I LOVE this outfit. This outfit is the hidden gem that I found in the bottom of the bag. It is bright, beautiful colors that fits perfectly on the Fashionistas Nikki doll. I also found this awesome handbag for her to wear with it. It matches the outfit perfectly and the entire outfit has a fun attitude. I gave her a pair of tall boots and now we are ready to go out on the town! 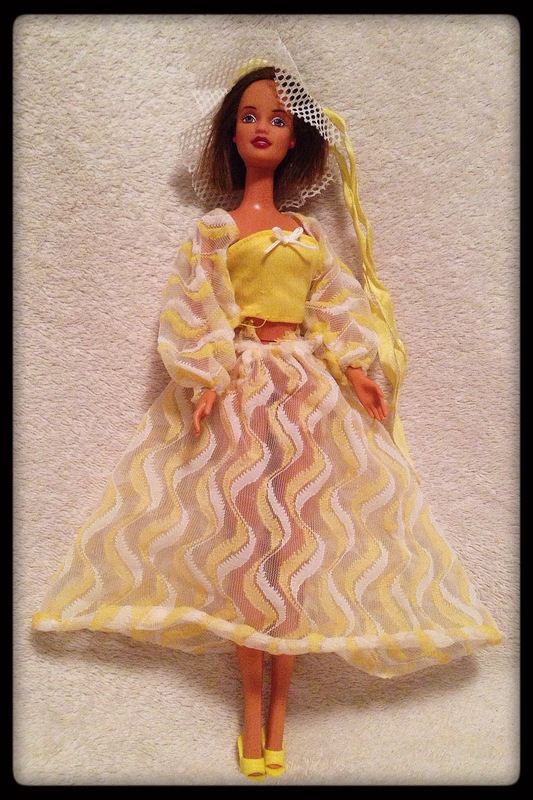 Just for fun, I had to dress up the Flower Power Teresa doll I used for Peri in something fun. It is a lovely and light yellow outfit. I think it is missing an under-skirt or bikini bottom because of how transparent the lace skirt is. I really like the hat. It needs to be ironed for it to fit really well, but it is adorable. I also like the cute yellow heels I found; they match the top perfectly. This is a fun spring outfit; I may use it for Easter this year. 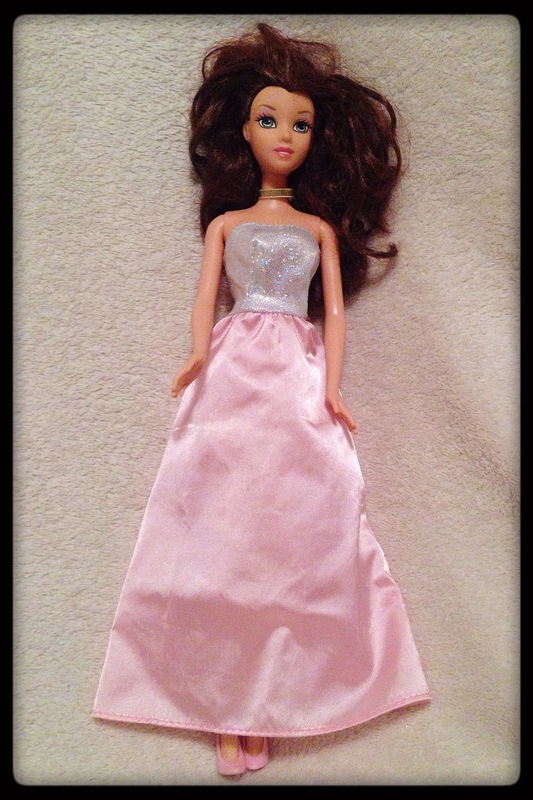 This is a Disney Aurora doll in a short dress. I was surprised by how well the dress fits; the fabric is stretchy and doesn’t fall down like some of the other dresses. It is a great piece that could work well with any number of dolls. This picture also shows one of the two head scarves that came in the bag. They have the Barbie tag in a really awkward place, but otherwise they are lovely scarves. That is it for today! I had a lot of fun dressing up the dolls and being able to share them with everybody. The revised pattern for Ood trousers is taking longer than expected. I also have a few Easter commissions that have taken center stage this week, so it is hard to find time to work on them. I will do my best to carve out an hour or two each day to get the pants knocked out and the next Whovian update taken care of. Until then, have a fantastic day! Nice find! At the thrift stores around here, there never seem to be clothes and accessories like shoes other than what is on the dolls for sale. I know! Almost every doll I’ve gotten this far has been naked, so this has been a great relief. The ones here all have clothes, might be a policy against naked dolls, but I have only seen one with shoes. $2.99 was the going rate but the newest ones I saw put out last time are all $3.99! Ooooo! That is awesome! Thank you so much for the information!!!! I thought the nested sleeve dress looked familiar, and now that you say that it makes perfect sense! I am so excited. Thank you, again, for commenting and giving me such helpful information.